HMD Global has added three new Nokia smartphones to its India lineup. HMD Global has added three new Nokia smartphones to its India lineup. While the company has launched the Nokia 2.1 and Nokia 5.1 for the first time in India, it has added a 3GB RAM option to the Nokia 3.1. Nokia 2.1, or Nokia 2 (2018), the company’s latest Android Go phone, has been priced in India at Rs 6,999. 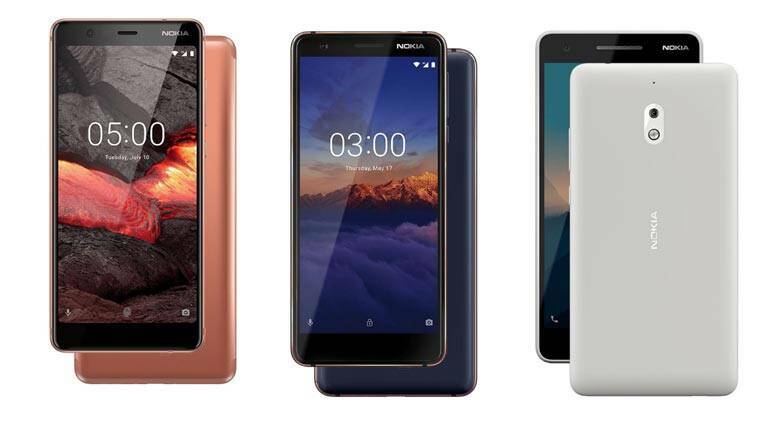 Also, all three phones will be available in retail stores and online – through Paytm Mall – and the Nokia online store from August 12. As part of the launch, the phones have been paired with 10 per cent cashback on Paytm recharges and bill payments. This will be available when a user scans the Paytm Mall QR code at any retail outlet. All phones also come with cashback offers and data benefits from Vodafone and Idea. For the Nokia 3.1 and Nokia 5.1, ICICI credit and debit card holders can also avail an additional 5 per cent cashback. Featuring a 5.5-inch HD display, Nokia 2.1 comes with a screen aspect ratio of 16:9 and anti-fingerprint coating. Based on Android Oreo (Go edition), it is powered by the Snapdragon 425 SoC, coupled with 1GB RAM, and a 4000mAh battery. Internal storage on the phone is 8GB, which is expandable to 128GB via microSD support. On the camera end, the Nokia 2 (2018) bears an 8MP rear sensor with autofocus and LED flash, as well as a 5MP fixed focus front camera. Connectivity options include 4G LTE, Wi-Fi 802.11 a/b/g/n, Bluetooth, GPS/A-GPS, a microUSB port, and a 3.5mm headphone jack. Sensors onboard the Nokia 2.1 include the accelerometer, ambient light sensor, and proximity sensor. Nokia 2.1 will be available in three colour variants: Blue/Copper, Blue/Silver and Grey/Silver. With a 5.5-inch full-HD+ IPS LCD display, Nokia 5 (2018) comes with a screen aspect ratio of 18:9 aspect ratio, as well as Corning Gorilla Glass 3 protection. Powered by the MediaTek MT6755S SoC, it is based on Android Oreo, and is paired alongside 3GB RAM. This is backed by 32GB of internal storage, and expandable memory of 128GB via microSD support. Nokia 5.1 is backed by a 3000mAh battery. The Nokia 5.1’s cameras include a 16MP rear sensor with PDAF and an LED flash, as well as an 8MP fixed focus lens. Connectivity options include 4G LTE, Wi-Fi 802.11 a/b/g/n, Bluetooth 4.2, GPS/ A-GPS, a microUSB port and a 3.5mm headphone jack. Sensors onboard the handset include accelerometer, ambient light sensor, gravity sensor, gyroscope, a rear-mounted fingerprint sensor, and proximity sensor. Launched at Rs. 14,499, the Nokia 5 (2018) will be available in Copper and Tempered Blue variants from its first sale, while a Black colour option will be made available soon. Meanwhile, Nokia 3.1 will also be available in a 3GB RAM/ 32GB storage variant. Priced at Rs. 11,999, this phone will be available in Blue/Copper, Black/Chrome, and White/Iron colour options.